Dawn Tending her Bees, spring 2015. Photograph by Kellie Buckley. In early June, mornings are cool and peaceful as the sun rises over the rich, verdant landscape of Fernwood Farm. Birds harmonize with the whir and clang of early morning chores, yet there is stillness in the air. Evanescent microdrops are poised in suspension over the pasture and coat the 1947 turquoise Studebaker truck. Dawn Soltysiak begins her day dressed in a T-shirt, jeans, and a red scarf tied over long, chestnut-brown braids. She sets out across the lawn toward a classic red barn, which houses her studio, kiln room, workshop, gallery, and a popular community gathering place. She makes a slight turn down the drive towards the back pasture. Before entering her studio, she pauses to glance across the road at the perfectly pitched roof of a neighboring long barn, which supports seventy-eight solar panels that supply the energy needed to fire her kilns and run the studio. On a perfect day, Dawn will work in her studio till early evening and spend a little time with her livestock before heading back to the house for a relaxing dinner on the porch. Fifteen years ago, Dawn and her husband, Rob, bought this thirty-acre working farm, located in southwest Michigan near the town of Fennville, as a major step toward living more sustainably. 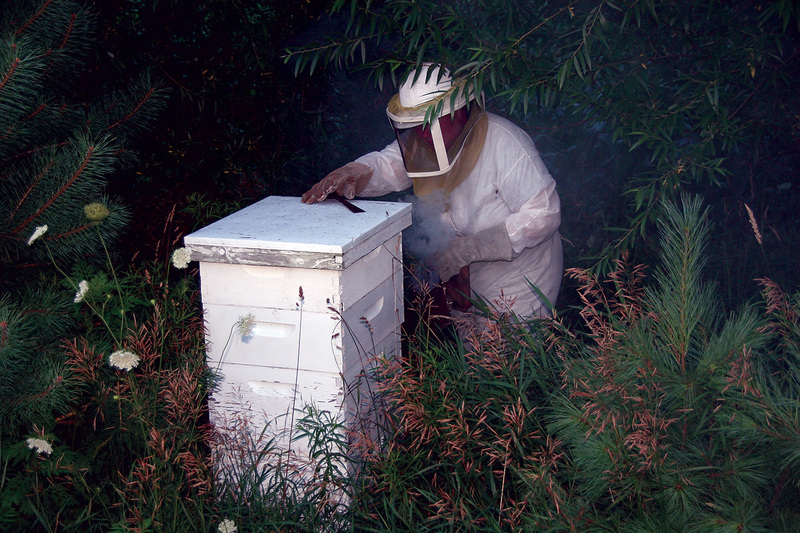 They raise grass-fed cows and pastured chickens and keep bees. During the first few years, Dawn commuted fifty miles to Grand Rapids to maintain her real estate business, while making art in her spare time. 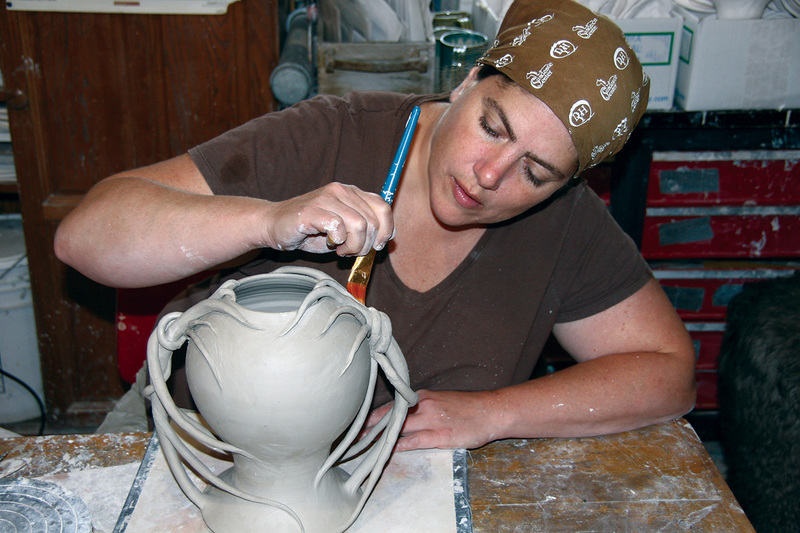 She knew that if she didn’t start a new life as a full-time artist soon, she might never do it, so in 2010, she ended her career in real estate to devote herself to ceramics. Because the farm has so many barns, converting one to a studio made sense. The conversion created a beautiful and useful space equipped with five wheels, three electric kilns, a raku kiln, slab roller, extruder, pug mill, and a wide selection of tools and glazes. She stores supplies in old wooden kitchen cabinets, handmade years ago by her father. Her students sit on antique chairs. “The chairs are from my mother’s studio from when I was a kid, and she purchased them used forty years ago. They are still in great shape, and I love having that personal connection in my studio every day. It is grounding to know where you come from,” Dawn says. Dawn named her studio Khnemu, after the Egyptian god of arts, crafts, creation, and water. According to legend, he used a potter’s wheel to create the cosmic egg that hatched the sun, followed by men and gods. In keeping with the name, the Khnemu Studio and Gallery is a center for creativity and community. 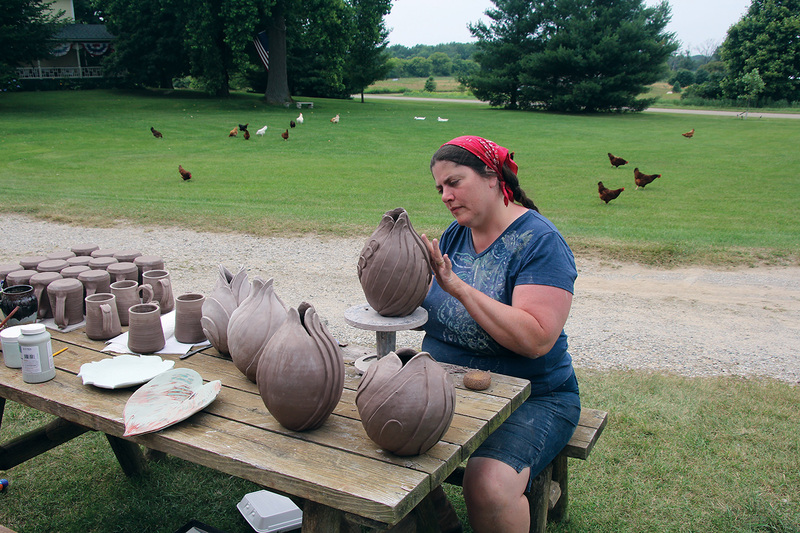 Dawn has developed a popular instructional program at her studio and offers classes in a continual year-round cycle. 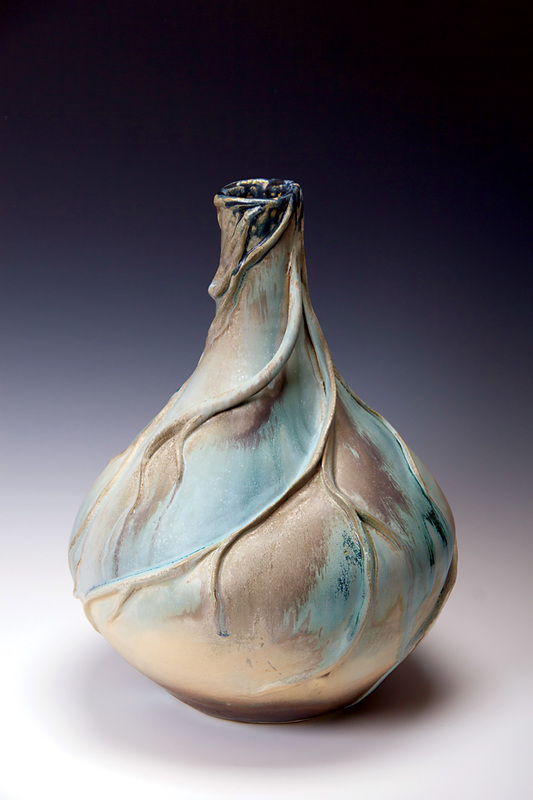 For advanced students, Dawn offers raku workshops and hosts two visiting artists each year for weekend workshops, such as Chemistry and Firing with John Britt and Innovations in Paper Clay Sculpture with Australian artist Graham Hay. Having already worked to introduce sustainable practices in farming and studio work, more recently Dawn turned her thoughts toward alternative energy sources. She applied for and was awarded a grant from the USDA’s Rural Energy for America program, which helps farms and rural small businesses to set up renewable energy systems by covering up to twenty-five percent of the cost. 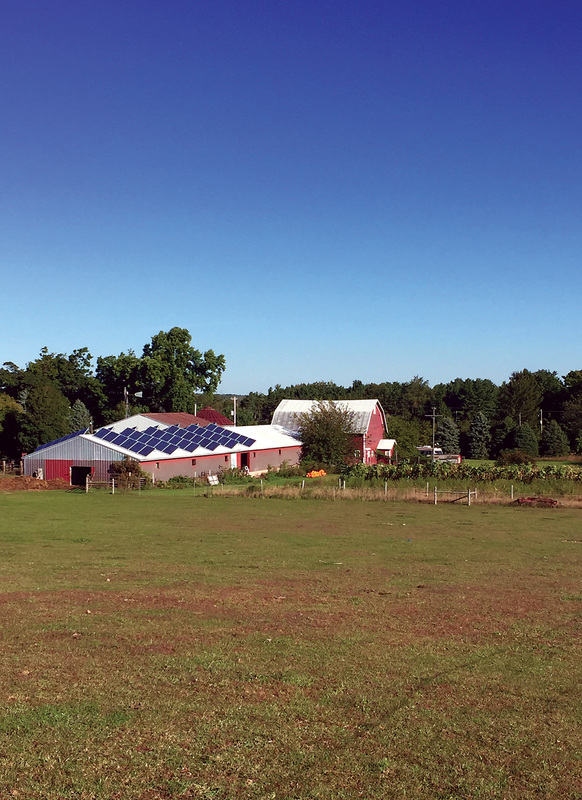 The long barn offered the perfect place for her seventy-eight 230-watt panels. The system produces enough power to run the studio, including the kilns, and the gallery. In 2015, Dawn opened the Root Coffeehouse and Café in downtown Fennville, an enterprise designed to bolster community connectivity and spotlight her sustainable practices. Along with the coffee mugs from her studio, fresh greens and colorful vegetables from the farm grace the tables of the café. "The café has very little trash because food scraps are brought back to the farm and fed to the animals,” Dawn says, “and we try to purchase as much locally as possible, which saves a lot of packing materials. I use things until they are no longer reusable.” The café is also open for community use in the evenings. A recent gathering of the West Michigan Potters Guild at the café featured a demonstration on innovative trimming techniques. “It makes me happy to pull community together. I strive to live a lifestyle that is in harmony with nature. I also strive to create a connection between artists and the community,” Dawn told me. She invites community members to visit the farm and to participate in events that include workshops, exhibitions, yoga classes, and festivals such as Family Farm Fest, held annually. She is a booster of more than seventy-five local artists and businesses through her farm gallery, the café, and her Fernwood 1891 Gallery next door.